As many of you already know, we have been faced with an uphill battle regarding our aging infrastructure. Willey, Prospect, Locust, Pine, and Spruce Streets have been experiencing poor water quality due to the large quantity of unlined cast-iron pipes throughout that area. Last year, it was brought to my attention by our Willey St. customers that they had been dealing with ongoing water color and odor issues. Reacting to this complaint, the District hired Wright Pierce (Engineering Firm) to perform a Corrosion Control Study on our Water Distribution System. In response to that study, operational changes have been made to help balance the water chemistry. Unfortunately, these changes can take a long time to show results and often additional additives are needed to further help balance the chemistry. The District has decided to add a sequestering agent to help with the immediate issues. This is a temporary solution; the ultimate solution will be to replace the lengths of pipe triggering the problem. 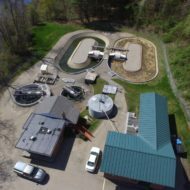 The District has recently been awarded an Asset Management Grant from the NH Department of Environmental Services (NHDES) that should be wrapping up by late fall. Wright Pierce has been hired to conduct the Asset Management study and will be able to help identify the needs of our system. This will allow us to accurately forecast a true budget to perform the needed repairs and replacements for our system. After consulting with Wright Pierce, NHDES, and Harcros (Chemical Supplier) regarding this issue, the District has made the decision to implement the addition of HC-2050. HC-2050 is a Poly/Orthophosphate blend that will help sequester color in our distribution system, and will also help with our ongoing corrosion control challenges. The addition of HC-2050 will require that all hydrants throughout the entire District be flushed. This may cause some discoloration of the water. PLEASE DO NOT WORRY. If you notice discoloration in your water, simply run the COLD WATER until it is clear. (‘Clear’ is when you can fill a white cup or glass with water and it looks clear to the eye.) The Water District never recommends drinking discolored water for any reason.